To save you some typing, the VideoGamePriceCharts.com website is now available at www.vgpc.com. All your old links will still work. However, if you want to use the new, shorter links, you're welcome to. If you notice any problems with the new domain name, please let us know. 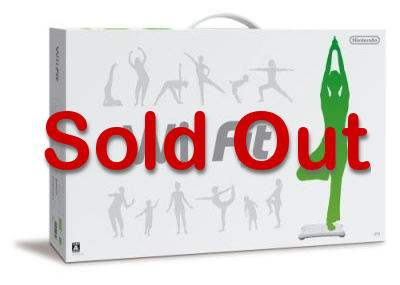 When Nintendo launched Wii Fit on May 19th they created another dream product for scalpers and ebay sellers everywhere. The game and balance board retail for $89.99, but the resale price of the package online has been averaging $150. This comes at a great time for scalpers. The Wii Console was starting to sell for retail prices online (after 18 months on the market). Lucky buyers couldn't resell the system and make easy money anymore. But Nintendo gives them a gift, another product that is hard to find at retail and can be sold for a hefty mark-up on ebay. 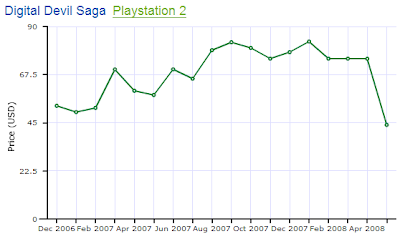 Here is a chart of the average price of Wii Fit for the four days it has been available. The prices have been coming down every day so maybe this profit dream for resellers won't last long. With a $50 markup online I bet a lot of the people waiting inline for the next Wii Fit shipment won't be using it to burn calories but using it to make a little money. UPDATE: The price for Wii Fit has not continued to drop as it did in the first few days on the market. Wii Fit is now selling for about $165 on amazon and ebay. Maybe those second shipments didn't arrive in stores as planned. Shin Megami Tensei Nocturne and Digital Devil Saga have been two of the most sought after Playstation 2 games for RPG fans and video game collectors. Atlus quietly reprinted these two games and made them available to a few retailers this April. The prices quickly plummeted almost 50% for both games in the resale market. Retailers started selling DDS reprints at the very end of April, around the 26th. The prices quickly dropped 43% from a $75 average price in April to $44 in May. 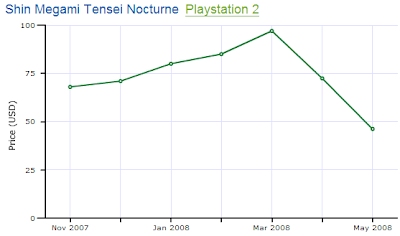 Nocturne was reprinted earlier in April than DDS (around the 17th) so the average prices started dropping in April and continued into May. In March Nocturne was selling for $97 on average and now in May the average price is $46, a drop of 53%. This reprint is great news for gamers who want to play these fantastic JRPG's but didn't want to pay $70-100 for a used game. Unfortunately it looks like Amazon has already sold out of the re-released DDS , but if you hurry you can still buy Nocturne on Amazon while it is still available for $40 . There are probably quite a few gamers who are upset that they bought one of these games two months ago for almost $100. That is a risk video game collectors make especially if you are buying games for a console that is still supported. Collectors and gamers are now wondering if the prices will stay at these lower prices or will they increase again in a few months? Thanks to our reader Alex for this article idea. We've added an optional additional column to our daily data downloads (aka Price Guides) to help you better link our data with yours. The new column provides a unique identifier for each product in our database. Before this change, you had to link our data to yours by comparing the UPCs or product names. The programming for that technique was more complicated than it needed to be. Now, you can simply correlate our product identifiers with your own product IDs to easily and consistently update your database from the daily downloads. We've updated the Basic and Premium sample files to reflect the new format. If you have any questions, please email us. You can now search for products on VGPC by UPC or ASIN. Just type one or the other into the search box and hit Enter. A moment later, you'll be at the price chart page for that product. If you find any UPCs or ASINs that don't appear to be working correctly, please let us know. Most of the world has heard by now that Grand Theft Auto IV came out April 29th and it was just announced that in the first week the game sold 6 million copies worldwide. The number of games sold for the 360 and PS3 hasn't been announced yet but so far Xbox 360 owners have been buying more of the classic GTA games than Playstation 3 owners. Prices for Grand Theft Auto San Andreas, GTA Double Pak, and GTA Trilogy have increased more on Xbox than Playstation 2. Buying all three older Grand Theft Auto games released on Xbox would cost $76 now instead of $64 in March, an 18% increase. Buying the same Playstation 2 GTA games would cost $33 now and were $30 in March, which is an 10% increase. If you look at all the PS2 GTA games, including the ones that were not released on the Xbox, you see only a 3% increase from March to May. During this time of year video game prices usually go down. This difference is either caused by increased demand, limited supply, or a combination of the two. On the supply side the Xbox game supply is limited while the PS2 supply can increase. The Playstation 2 is still around and retailers are continuing to sell new games. You could find many of these PS2 GTA games brand new at stores. This stops the used prices from increasing very much because the supply can increase too. Xbox games on the other hand are not as easy to find new. Many retailers stopped selling them so the supply of these games is static. In terms of demand, the Xbox 360 has sold more consoles than the Playstation 3. Assuming the game sells the same proportionally on both systems there are more GTA IV 360 owners. Which means there are more 360 owners who are looking to play the classic GTA games. Below are the side by side price comparisons for each Grand Theft Auto game on Xbox and PS2. Click the charts to see the most recent prices. The Xbox prices are more expensive than the PS2 for every Grand Theft Auto game. And Xbox Trilogy for Xbox is somewhat of a rare game now, selling for more than the initial retail price. for the game during the last 90 days, but you can still click the link to see the historic prices. We have some changes in the works which should prevent this kind of thing from happening, even for low volume games, but those changes aren't quite ready. Thanks for the feedback and keep it coming.